On N. Driver, where the Bulls used to play, later East Durham Jr. High, now becoming the Holton Comm. Center. I'll be there in a few months. Is the current spelling for Ellerbe Creek with one "e" on the end, or two? Most published items appear to use one "e."
Also, was the original club house Dutch Colonial or Arts & Crafts? Love your blog and I appreciate your diligent work. Your love of the topic(s) shines through. The City spells Ellerbee with two e's. The State, the Friends of South Ellerbe and the Ellerbe Creek Watershed Association spell it with one e.
In the earliest grants and on the earliest maps, Ellerbe Creek was spelled "Allibay." That spelling led a few scholars to theorize that Ellerbe might be of Native American derivation. When the Europeans arrived, the North Carolina Piedmont was dominated by Sioux-speakers such as the Eno, Occaneechi, Saponi, Sissipahaw, Tutelo, and Shoccoree. Different European ears heard the Siouxan consonant that had a sound somewhere between an R and an L. Thus, there is much speculation about Ellerbe Creek's oldest name. In the days before standardized orthography, the creek carried a variety of names including, Allibay, Allibay's, Eleby, Ellerbee, Ellerbie, and Ellerbe. When I was in elementary school in Durham in the 1950's the old club house was being used as the Children's Museum. We went on field trips there. My best memory is of a glass cabinet on the front porch in which lived a lizard we were told was a Gila Monster. The Children's Museum later became the Museum of Life and Science now located on Murray Ave. I think you've just helped solve an enduring mystery for me, which was the location of the Durham Children's Museum prior to the establishment of the Museum of Life and Science in the 1960s. There is little mention of it prior to the MLS days, although I know from newspaper articles that it existed. This certainly seems to establish that this building was no longer being used as a golf clubhouse by the 1950s. golfing the hillandale course is excellent. the club offers pretty decent prices, especially for 'late play' fees. and the staff is always friendly. Actually, the Durham Children's Museum was in a large old home just west of the corner of present-day Georgia and Wilson (see Google Maps). The Clubhouse was near the corner of Club and Hillandale, several hundred feet southwest of the DCM. The DCM and Clubhouse were demolished around the same time. We lived a block around the corner from that original club house location for a few years, having moved there in 1967, and I actually know the family that occupied the house that was built over that property. My street (Woodrow) is likely the one running horizontal across the top of photo. Ours was one of the last lots to get built at the time, so it's hard for me to imagine that area club house. I've always enjoyed playing golf at Hillandale, and hope the city will rescue and preserve it for another generation of golfers to enjoy. Around the turn of the 20th century, John Sprunt Hill acquired several hundred acres west of Durham (which he referred to as "that old Jones Land".) Like all of Durham's wealthiest men of the period, Hill established a gentleman's farm. Unlike most of them, he had a strong genuine interest in the economics of farming, and would later seek. to stabilize farm markets through the establishment of the Central Carolina Farmer's Exchange. In 1905, when his wife's grandfather, Gerard Watts (of Baltimore) died, he left a herd of prize Guernsey cattle. Hill took six years to prepare his farm for the Guernseys, but brought them to his "Hill 'in Dale" farm. He continued to farm crops as well, such as asparagus and potatoes. Hill, though, was also a passionate golfer. He and his father-in-law were regular visitors to Pinehurst, and Watts would often travel to Palm Beach, FL to play during the winter. Hill wanted to establish a course closer to home, and by 1908, had decided on a portion of his farm that would become a golf course. He hired Donald Ross, who had designed the Pinehurst golf course, to design a nine hole course for him; the course was laid out along the rolling hills extending north from the Hillsborough Road ridge, primarily from the hill near the western terminus of present-day Club Boulevard, across the creek bed of Ellerbee Creek. 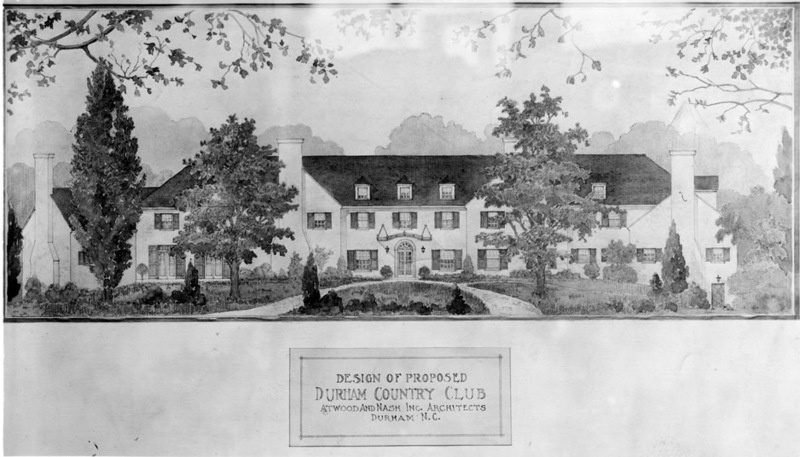 In 1911, he hired an architect to build the clubhouse for which Club Boulevard would be named; the 'Dutch Colonial' style building, per Howard Covington (although it looks not at all Dutch Colonial) had large porches on both first and second floors, which were evidently a $15,000 addition. 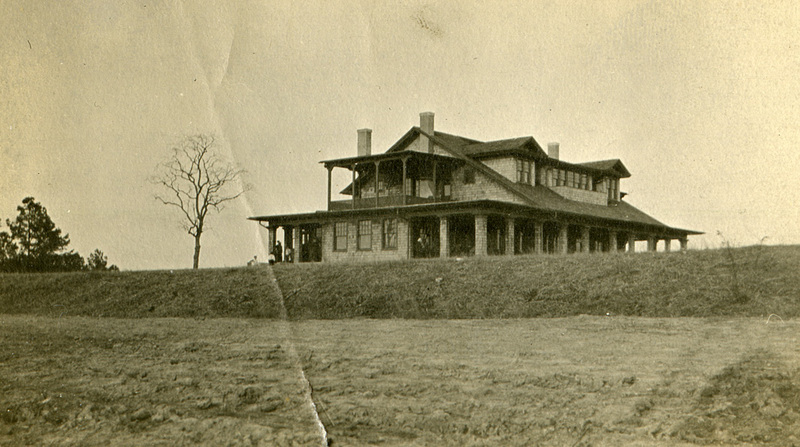 Per Howard Covington, the Durham Morning Herald reported that the clubhouse was "cool and restful in appearance and standing on the crest of a hill it overlooks hundreds of acres of beautiful landscape." In the fall of 1911, Hill persuaded a New York golf club manager, Alex Pirie to come to Durham to manage the club, provide lessons, and run a pro shop at club. In March, 1912, Hill and others organized the Durham Country Club, and they played the first round of golf on the course on April 8, 1912. Watts, Hill, Hill's brother Isham Hill and Reverend E. R. Leyburn, the senior minister at First Presbyterian Church made for a regular foursome on the course. Leyburn and Watts evidently regularly played a Monday afternoon game thereafter. Membership was $12 a year for men and $6 for women. (Ben Duke's wife Sarah and their daughter Mary were among Durham's early female golfers at the course.) In 1915, Hill expanded the course to 18 holes, when he had Perry Maxwell design an additional 9. The West Durham trolley line of the Durham Traction Co., which had been extended up Broad Street to Watts Hospital after its construction in 1907, was extended westward on Club Boulevard in 1912 to reach the clubhouse and golf course. Construction began on the large reservoir and water treatment plant immediately across Hillandale Road, which proffered an impressive vista to club visitors sitting on the terrace, as well as boating opportunities to other visitors. In this way, Durham Traction company worked with other interests to create a trolley terminus destination for recreational users, much as they had with the East Durham ballpark, and much as they would with Lakewood Park. 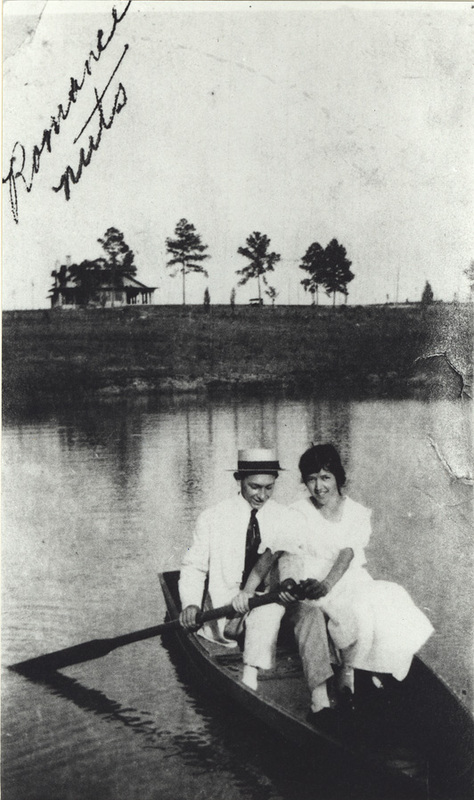 Beatrice & Graham Maynard, "Romance Nuts," boating on the Durham reservoir with the clubhouse in the background. Hill also commenced (or financed) residential construction of much of the adjoining neighborhood of Oval Park through his Durham Realty and Insurance Company, a division of Durham Loan and Trust. By the late 1920s, area dynamics changed considerably due to the rise of automobile transportation and the Depression. 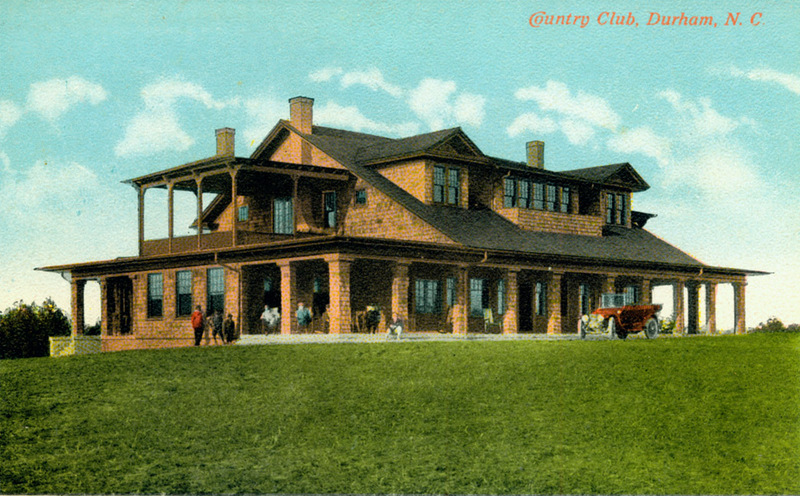 Perhaps for these reasons, a planned new country club was never constructed. Another Donald Ross designed golf course, with a new clubhouse built by Aymar Embury were built in 1926 in Hope Valley, and a golf course and clubhouse designed by George Watts Carr completed in the mid 1920s in Forest Hills began to attract patrons and residential development. In 1930, the trolley service on Club Boulevard was discontinued. 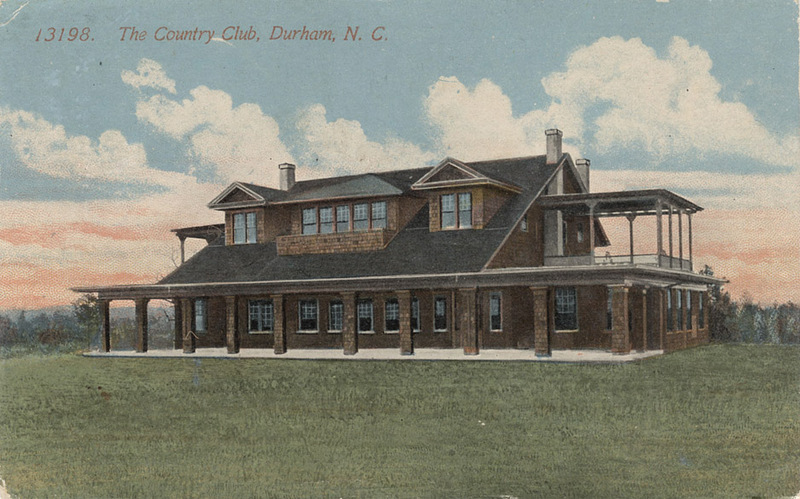 At some point in the 1920s, the Durham Country Club went bankrupt, although Hill continued to keep the club, pro shop, and golf course operating through his own financial support. In 1934, Hill announced that we would donate the course to the City of Durham, a gift which appears to have been consummated by 1939, a year after he donated the former Forest Hills golf course to the city for use as a park. The course and pro shop would continue to be operated by the Durham Foundation, which operates the course today. The foundation evidently continued to use the old clubhouse through the mid-20th century, although I've uncovered no pictures or information from this period. Howard Covington writes that, in June 1955, John Sprunt Hill donated nine acres of additional land for two new holes at the golf course, and in 1957, he donated lots in the Bellevue subdivision that were sold to pay for "a rebuilding program at the course." And in 1959, Hill's daughter Frances Hill Fox and her husband donated an additional 14 acres "for additional changes at Hillandale." I don't know if these donations specifically involved the old clubhouse, but clearly they were a part of impending changes to the course that would lead to the old clubhouse's demise. Aerial of the clubhouse, Club Blvd. and Hillandale Road with its large circular drive off of Club - the reservoir is the grey area on the left side of the photo, 1959. In 1961, the original club house was demolished, a new one constructed to the north on Hillandale road, and the course was redesigned. The original club house land and original portion of the course were sold off as building lots, soon filled with individual homes. The course continues to be open to the public today. I'm not a golfer, so I really can't weigh in on the golfing experience. It certainly appears nice, driving north on Hillandale Road - a green respite before emerging into the greyscape of I-85.